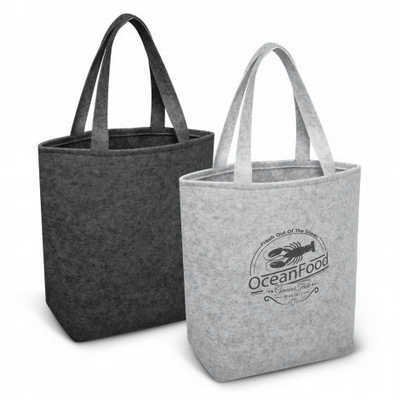 Fashion inspired medium size tote bag with long handles. It has a base gusset for added capacity and is manufactured from trendy poly-felt. Colours: Light Grey, Dark Grey. Dimension: H 345mm x W 335mm x Gusset 110mm (excludes handles). Print Description: 200mm x 200mm. Print Type: Screen Print . Packing: Loose packed. Price includes : Printing Per Colour/Position. Setup is included.